On June 16, 2014, at age 66, Ralph Oneal chaired the Gulf Coast Elder Abuse Conference – Louisiana’s first regional forum to address the growing number of threats and schemes targeting seniors. Produced by the St. Tammany Parish chapter of Seniors and Law Enforcement Together (SALT), the conference featured an extensive schedule of classes conducted by nationally recognized authorities on elder abuse. Attendees from such varied professions as law enforcement, banking, healthcare administration and social services united this day to address issues and foster a safer world for seniors. In the U.S., there are three other major conferences that focus on elder abuse. 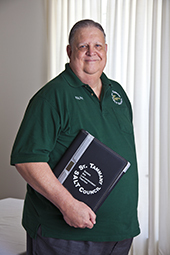 Unlike those three, which are put on by large professional organizations, the Gulf Coast forum was developed and produced by the volunteers of the St. Tammany SALT Council. Led by the vision and efforts of co-volunteer Ralph Oneal, the Gulf Coast conference’s success hinged on the knowledge and expertise he earned over his lifetime. An extensive career in law enforcement gave Oneal an ideal opportunity to develop skills needed to orchestrate such an event. Getting many different people to commit their time, expertise and effort toward a common goal requires a deep understanding of human behavior and motivators. Oneal’s decades of interacting with diverse populations honed his ability to understand others and to adapt the way he communicated with different individuals, adjusting his approach and style to increase the likelihood of a positive outcome. Good communication skills are doubly effective when combined with passion for a cause, and Oneal is quite passionate about protecting seniors from the increasing onslaught of criminals and scam artists they face. Oneal saw a need and used his experience to build this year’s conference, but his drive and passion didn’t stop there. He’s already made great strides organizing the next conference and the next step in making the world safer for the elderly. Ralph Oneal … Peoples Health Champion.